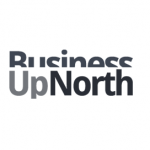 When one of the world’s leading innovators in e-Security solutions decided to set up a new UK nerve centre in Cambridge, the keyword of the design brief was collaboration. Thales UK is an arm of the French corporate giant The Thales Group which has an ever-expanding presence right around the globe, but it was Cambridge that came out on top as the preferred location for the company’s new flagship site for international growth. Thales joins the likes of Apple, Microsoft and Amazon in placing down roots in Cambridge, with the city now becoming globally recognised as a creative hub for championing and advancing fresh talent in science and technology. The brief for the new office was to create a flexible environment which has the capacity to support the group’s complex technological infrastructure whilst also providing a productive and appealing workspace that promotes natural collaboration and creativity. The commission was undertaken by Overbury – the office fit out specialists with a long legacy stretching back to the repairing of war-torn London buildings in the 1940s, and more recently developing their reach across the UK. The core of the project is the Innovation Hub situated in the middle of the space, with traditional workstations placed around the perimeter in an open plan design. Perhaps one of the most common obstacles to simple daily interaction in a typical office layout is that team members are often largely hidden away from each other and only ever meet up for very specific purposes. A key point in this project blueprint is that colleagues will actually need to wander right through the central Hub in order to reach the other end of the office, boosting opportunities for spontaneous and potentially fruitful interaction and collaboration. Any such chance encounters can easily be developed in further detail with handy touchdown points planted around the Hub, including huddle spaces, seating booths, private meeting pods and open banquette seating. To put this In a very spacious nutshell, there’s scope for every breed of meeting and discussion in this dynamically-furnished hub. Let’s go back to those private pods. Meetings can be conducted in both privacy and style with the vivid glass film design of the glass walls adding layers of vibrant colour and concealment. Innovative thinking on a global scale is promoted and encouraged throughout the other meeting areas. 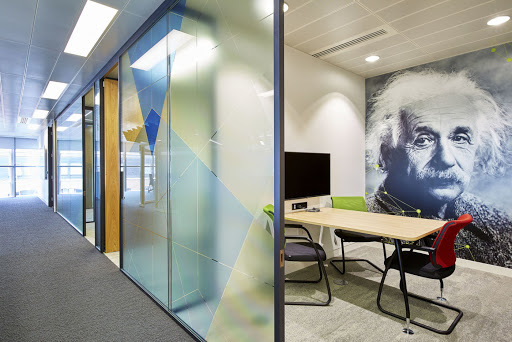 The seating booths are decorated with artwork of beautiful scenes from all over the world, while the walls of the meeting rooms feature floor-to-ceiling art prints of some of the greatest minds in history, serving as both a visual inspiration to think creatively and as a daily reminder of the company’s global reach. 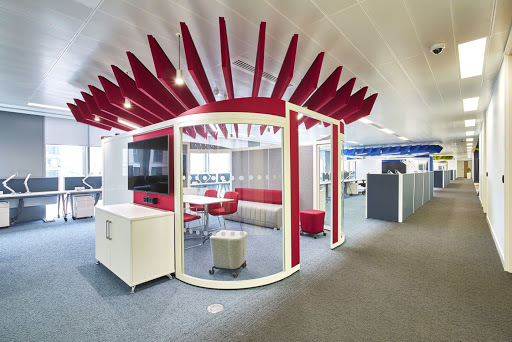 You’ll even find deckchairs thrown into the meeting mix for more casual and relaxed discussions, while a separate flexible meeting space near the front of the of the office can be quickly converted into a ‘Town Hall’ space for office-wide talks. Things can naturally get a bit lively and noisy in such a busy environment, so one of the key points of the brief was to try and reduce the distracting high volume for fellow workers who need to concentrate! 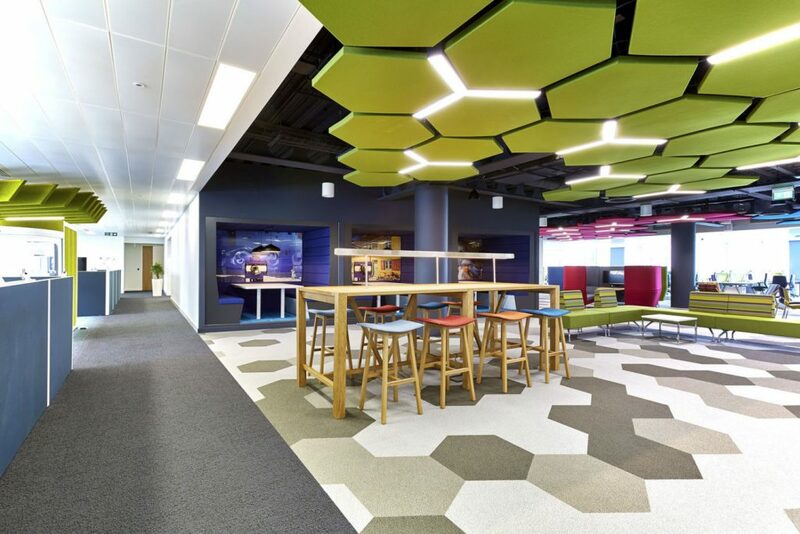 Stunning acoustic hexagonal ceiling panels and acoustic surfaces are used throughout the space which don’t just look magnificent – they also help turn down the volume on excess noise and chatter of the open-plan layout. The hexagonal theme is replicated on the patterned carpets, creating a stunning mirrored image of the striking view above. Noise reduction was also a key element of the separate Complex Comms Room which houses mighty-powered servers cooking up a huge amount of racket and heat. Sound acoustic attenuators were installed in the room to reduce the impact of the noise, while the floor of the Comms room was raised 600mm to facilitate extra air conditioning and the installation of Denco units to help keep everything cool. As Thales continue to innovate and foster a growing international presence, the new nerve centre in Cambridge is perfectly fit out to ensure that the talented team members can work together in an environment engineered to support brainpower, spontaneity, and increased productivity.